When will be The Eleventh Hour (US) next episode air date? Is The Eleventh Hour (US) renewed or cancelled? Where to countdown The Eleventh Hour (US) air dates? Is The Eleventh Hour (US) worth watching? 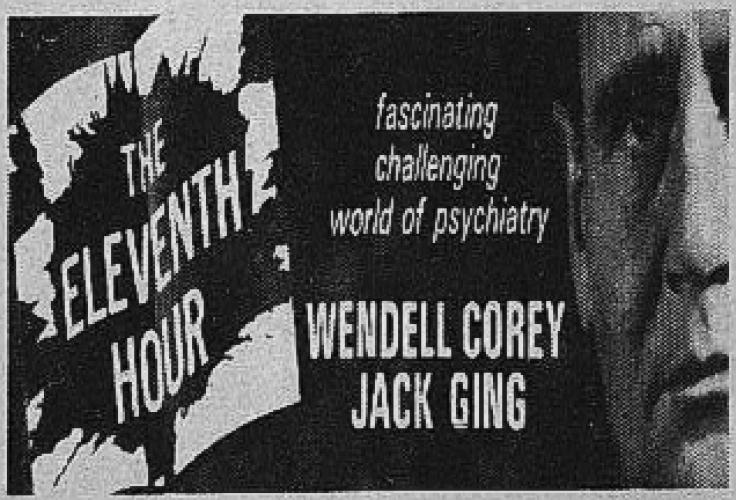 The Eleventh Hour, starring Wendell Corey and Jack Ging in the first weekly dramatic series with psychiatry as its theme, had its premiere on October 3, 1962 at 9.30 p.m. The Eleventh Hour was developed by the same highly successful television team which gave birth to the Dr. Kildare series. Wendell Corey, who was once president of Hollywood's Academy of Motion Picture Arts and Sciences, portrayed Dr. Theodore Bassett, a psychiatrist often called in by the courts for opinions. He also had a general practice and was attached to a large metropolitan hospital, giving a wide range and variety to the dramatic stories in The Eleventh Hour. Jack Ging played Dr. Paul Graham, a clinical psychologist who was Bassett's associate. Guest stars in this hour-long stories included such noted performers as Franchot Tone, Chester Morris, Stephen Hill, Mai Zetterling, Barbara Rush, David Janssen and Nancy Kelly. EpisoDate.com is your TV show guide to Countdown The Eleventh Hour (US) Episode Air Dates and to stay in touch with The Eleventh Hour (US) next episode Air Date and your others favorite TV Shows. Add the shows you like to a "Watchlist" and let the site take it from there.